The American general William T. Sherman was born on the 8th of February 1820, at Lancaster, Ohio. He was descended from Edmond Sherman, who emigrated from England to the Massachusetts Bay Colony in 1634. His father, Charles R. Sherman, a judge of the Supreme Court of Ohio, died suddenly in 1829, leaving his widow with a family of young children. William was adopted by the Hon. Thomas Ewing, a close friend of the father, sometime a Senator of the United States and a member of the national cabinet. In 1836 he entered West Point, and on graduating near the head of his class he was appointed second lieutenant in the 3rd artillery regiment. His first field service was in Florida against the Seminole Indians. The usual changes of station and detached duty made him acquainted with the geography of all the Southern states, and Sherman improved the opportunity by making topographical studies which proved of no small value to him later. He also employed much of his time in the study of law. When the war with Mexico began in 1846 he asked for field duty, and was ordered to join an expedition going to California by sea. He was made adjutant-general to Colonel Mason, military governor, and as such was executive officer in the administration of local government until peace came in the autumn of 1848 and the province was ceded to the United States. In 1847 he served on the staff of the general commanding the division of the Pacific. In 1850 he married Ellen Boyle, daughter of Thomas Ewing, then Secretary of the Interior. Transferred in the same year to the commissariat department as a captain, he resigned three years later and went back to California to conduct at San Francisco a branch of an important St. Louis banking-house. He continued successfully in the management of this business through a financial crisis incident to a wildly speculative time, until in the spring of 1857 the house, by his advice, withdrew from Californian affairs. Afterwards for a short time he was engaged in business at New York and in 1858 practiced law at Leavenworth, Kansas. In 1859, the state of Louisiana proposing to establish a military college, Sherman was appointed its superintendent. On the 1st of January 1860 the "State Seminary of Learning and Military Academy" was opened, and here Sherman remained until the spring of 1861, when it was evident that Louisiana would join the states seceding from the Union. He thereupon resigned the superintendency and returned to St. Louis, parting with the Governor of the state and his colleagues in the school with regret and mutual esteem. Though his brother John Sherman was a leader in the party which had elected Abraham Lincoln, William Sherman was very conservative on the slavery question, and his distress at what he thought an unnecessary rupture between the states was extreme. Yet his devotion to the national constitution was unbounded, and he offered his services as soon as volunteers for the three years' enlistments were called out. On the 14th of May 1861 he was appointed colonel of the 13th U.S. Infantry, a new regiment, and was soon assigned to command a brigade in General McDowell's army in front of Washington. He served with it in the first battle of Bull Run, on the 21st of July. Promoted brigadier-general of volunteers, Sherman was in August sent to Kentucky to serve under General Robert Anderson. In October he succeeded to the command of the department. On the 26th of October he reported that 200,000 men would be required for the Kentucky campaign. He was relieved of his post soon afterwards in consequence, but the event justified Sherman's view. He was soon re-employed in a minor position, and, at the head of a division of new troops, accompanied Ulysses S. Grant's army to Pittsburg Landing. At the battle of Shiloh Sherman's gallant conduct gained him promotion to major-general. His appreciation of Grant, and his sympathy with the chagrin he suffered after this battle, cemented the friendship between the two. He took part in Halleck's advance on Corinth, Mississippi, and at the close of 1862 led the Mississippi column in the first Vicksburg campaign. He suffered defeat at Chickasaw Bayou, but the capture of Fort Hindman, near Arkansas Post, compensated to some extent for the Vicksburg failure. In Grant's final Vicksburg campaign Sherman commanded the XV corps and the right of the investing line, and after the surrender he was sent to oppose General Albert Sidney Johnston in the country about Jackson, Mississippi. In July he was made a brigadier-general in the regular army. When, after Rosecrans's defeat at Chickamauga, Grant was placed in supreme command in the west, Sherman succeeded to the command of the Army of the Tennessee, with which he took part in the great battle of Chattanooga. He had already prepared for a further advance by making an expedition into the heart of Mississippi as far as Meridian, destroying railways and making impracticable, for a season, the transfer of military operations to that region; and on Grant becoming general-in-chief (March 1864) he was made commander of the military division of the Mississippi, including his Army of the Tennessee, now under McPherson, the Army of the Cumberland, under George Henry Thomas, and the Army of the Ohio, under John McAllister Schofield. Making detachments for garrisons and minor operations in a theatre of war over 500 miles wide, he assembled, near Chattanooga, his three armies, aggregating 100,000 men, and began (May 1864) the invasion of Georgia. 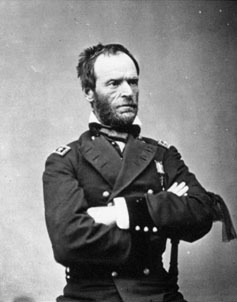 After a brilliant and famous campaign of careful manoeuvre and heavy combats, Sherman finally wrested Atlanta from the Confederates on the 1st of September. His able opponent Johnston had been removed from his command, and John Bell Hood, Johnston's successor, began early in October a vigorous movement designed to carry the war back into Tennessee. After a devious chase of a month Hood moved across Alabama to northern Mississippi. Sherman thereupon, leaving behind Thomas and Schofield to deal with Hood, made the celebrated "March to the Sea" from Atlanta to Savannah with 60,000 picked men. After a march of 300 miles Savannah was reached in December. Railways and material were destroyed, the country cleared of supplies, and the Confederate government severed from its western states. In January 1865 Sherman marched northwards again, once more abandoning his base, towards Petersburg, where Grant and Robert E. Lee were waging a war of giants. Every mile of his march northwards through the Carolinas diminished the supply region of the enemy, and desperate efforts were made to stop his advance. General Johnston was recalled to active service, and showed his usual skill, but his forces were inadequate. Sherman defeated him and reached Raleigh, the capital of North Carolina, on the 13th of April, having marched nearly 500 miles from Savannah. Lee's position in Virginia was now desperate. Hood had been utterly defeated by Thomas and Schofield, and Schofield (moved 2000 miles by land and sea) rejoined Sherman in North Carolina. With 90,000 men Sherman drove Johnston before him, and when Lee surrendered to Grant, Johnston also gave up the struggle. There was much friction between Sherman and War Secretary Edwin M. Stanton before the terms were ratified, but with their signature the Civil War came to an end. Sherman had the good fortune to learn the art of command by degrees. At Bull Run his brigade was wasted in isolated and disconnected regimental attacks, at Shiloh his division was completely surprised owing to want of precaution; but his bravery and energy were beyond question, and these qualities carried him gradually to the front at the same time as be acquired skill and experience. When therefore he was entrusted with an independent command he was in every way fitted to do himself justice. At the head of a hundred thousand men he showed, besides the large grasp of strategy which planned the Carolinas march, besides the patient skill in manoeuvre which gained ground day by day towards Atlanta, the strength of will which sent his men to the hopeless assault of Kenesaw to teach them that he was not afraid to fight, and cleared Atlanta of its civil population in the face of a bitter popular outcry. Great as were his responsibilities they never strained him beyond his powers. He has every claim to be regarded as one of the greatest generals of modern history. When Grant became full general in 1866 Sherman was promoted lieutenant-general, and in 1869, when Grant became president, he succeeded to the full rank. General Sherman retired, after being commanding general of the army for fifteen years, in 1884. He died at New York on the 14th of February 1891. An equestrian statue, by Saint Gaudens, was unveiled at New York in 1903, and another at Washington in the same year.